This is the third edition of a classic source that provides article-by-article commentary on the UN Charter. The new edition includes a chapter on UN reform. Crawford’s clear writing and substantial revision of this classic treatise make it an excellent starting point for public international law research. Revised in 2012, this publicly-accessible online Handbook highlights many aspects of treaty law and practice. It provides many cites to relevant articles of the Vienna Convention on the Law of Treaties. It also includes a helpful glossary of key treaty terms (such as accession and ratification), which begins on p. 62. This new source reviews concepts ranging from making to terminating treaties. It includes a chapter on the Vienna Convention rules about treaty interpretation. Practising Law Institute (PLI) treatises and course handbooks are no longer available through either WestlawNext or Westlaw Clasic. As I noted in a prior post, however, many PLI treatises, deskbooks and answer books from 2008 to present are available through Bloomberg Law. In Bloomberg Law’s home page, there is a “Resources” box. Click: “Books & Treatises.” Under heading “PRACTISING LAW INSTITUTE” click: “All PLI Books & Treatises” to view available sources. These include: DIrectors’ & Officers’ Liability (Oct. 2012) by James A. Fanto; Soderquist on the Securities Laws (March 2012) by Gary M. Brown; and Trade Secrets: A Practitioner’s Guide (June 2012) by Henry H. Perritt, Jr. A BLS student, faculty member or administrator can register to obtain a law school account from Bloomberg Law. Many practice-oriented publications of the American Bar Association are also available through BLS Library. These titles range from Ipad Apps in One Hour for Lawyers (2012) by Tom Mighell to How To Build and Manage a Personal Injury Practice (2012) by K. WIlliam Gibson. To view recently published ABA sources available through BLS Library, search SARA catalog by keywords: american bar association. Then, in the pull-down menu on the right, view search results by: Publication/Copyright date: Newest to Oldest. Practical Law Company also allows BLS students, faculty and admistrators to register for law school accounts. PLC’s available materials include model documents, checklists, practice-area overviews and updates about legal developments. PLC focuses on these practice areas: commercial; corporate and securities; employee benefits and executive compensation; finance; intellectual property and technology; international arbitration (new); labor and employment; and litigation (federal). PLC also provides some materials for: antitrust; real estate; and tax. Librarians at the BLS reference desk (refdesk@brooklaw.edu or 718 780 7567) could assist in identifying potentially useful sources for your research. One of my favorite sources of legal news and analysis is the Law360 web site. Also, BLS students, faculty and administrators can sign up to receive daily (Monday-Friday) Law360 e-mail alerts about developments in topic areas of interest. These topics include: Appellate Law, Competition, Intellectual Property, International Trade and Technology. On September 25, Law360 will launch a new “wire” topic: Corporate Law360. According to a Sept. 14, 2012 Law360 update, Corporate Law 360 will cover “developments in Delaware corporate law; compliance issues at the state and federal level, including securities, employment, and environmental regulation; shareholder rights and other corporate governance matters; executive compensation; consumer protection and privacy rights; directors and officers liability and other corporate insurance issues; creditor and debtor rights issues in Chapter 11 cases; high-stakes litigation; personnel moves; and pertinent legal industry trends.” Corporate Law360 will be included in our BLS subscription. One change: Corporate Law360 will replace the existing Top News category. What’s New in Bloomberg Law? Bloomberg Law provides many valuable sources, such as: case dockets and some documents described in the dockets, a database of “breaking complaints” filed in selected courts, Dealmaker Documents & Clauses (under the “Transactional” tab), current company information/ability to create reports about many companies, breaking news about financial markets, and Bloomberg BNA materials. Bloomberg Law will rank case results in reverse chronological order. SEARCH TIP #2: If a researcher knows that a high level court has addressed an issue, the researcher should begin searching in the narrow database of high level court decisions. Example: If the U.S. Supreme Court has addressed an issue, the researcher should begin searching in Bloomberg Law database: Court Opinions > All U.S. Supreme Court Opinions, rather than in database: Court Opinions > All Federal Court Opinions. This will prevent recent U.S. district court cases from appearing at/near the top of the results list. SEARCH TIP #3: Under top-level tab “Search and Browse,” there are links to search templates for: court opinions, legislative sources, regulatory sources, DealMaker documents/clauses,dockets,Domain Name dispute decisions, EDGAR filings with the SEC, news, patents, and people. SEARCH TIP #4: Top-level tab: “Practice Centers” links to Practice Center pages for: Antitrust, Banking & Finance, Bankruptcy, Corporate/M&A, Employee Benefits, Health, Intellectual Property, Labor & Employment and Securities. When possible, use the search boxes in these Practice Center pages. Account Manager Pamela Haahr (oribe@bloomberg.net) can arrange for current BLS students, faculty and administrators to obtain Bloomberg Law passwords and training. TIP: One can receive email notifications (headlines or editors’ highlights) for Bloomberg BNA legal news sources. Getting the Deal Through volumes (international and comparative guides to laws and regulations in 40+ practice areas). Among the updated volumes are: Arbitration 2012, Banking Regulation 2012, Climate Change 2012, Corporate Governance 2012, Environment 2012, Patents 2012 and Trademarks 2012. Many current PLI publications such as: Copyright Law: A Practitioner’s Guide (Jan. 2012), Deskbook on Internal Investigations, Corporate Compliance & White Collar Issues (May 2012), Expert Witness Answer Book (Feb. 2012), Immigration Fundamentals: A Guide to Law & Practice (May 2012), Likelihood of Confusion in Trademark Law (May 2012), New York Elder Law Handbook (Apr. 2012), Soderquist on the Securities Laws (Mar. 2012), Substantial Similarity in Copyright Law (May 2012), Trade Secrets: A Practitioner’s Guide (June 2012) and Transfer Pricing Answer Book (Mar. 2012). There are also many PLI materials with 2011 publication dates in Bloomberg Law, such as Directors’ & Officers’ Liability (Oct. 2011), Financial Institutions Answer Book 2012: Law, Governance, Compliance (Nov. 2011), and Soderquist on Corporate Law and Practice (Aug. 2011). Some recent ABA publications, such as Corporate Counsel Guides: Understanding Asia (2011), Corporate Director’s Guidebook (6th ed. 2011), and Fundamentals of Corporate Governance: A Guide for Directors and Corporate Counsel (2nd ed. 2011). Note: At present, a law library could not rely on the ABA materials in Bloomberg Law as a substitute for sources in an ABA Package Plan. I will be recommending Bloomberg Law as a source for note topic development in the coming weeks! Please join us for a “lunch (free!) and learn” program about finding and using court documents on Wednesday, April 4, 2012 at 1 PM in room 113M of BLS Library. Reference Librarian/Adjunct Assistant Professor Sara Gras will discuss how legal researchers can use briefs, motions and pleadings 1) to develop legal arguments and 2) to identify primary legal sources cited in similar cases. Then, she will highlight court documents available in Bloomberg Law, LexisNexis and WestlawNext. Feel free to ask BLS librarians about these new tools. Jean Davis providing research instruction to participants in the Safe Harbor Project on Sept. 21, 2011. 1) Responding to a request made by the Technology Secretary of the SBA, there is now a printer and release station on the first floor of the library (location: alcove near the reference desk). 2) To aid clinic participants and faculty, I licensed PsycINFO database, and it will become available to patrons on October 1. I believe that articles identified through this database will help clinic participants to better understand and represent clients who have experienced trauma. 3) A number of our librarians are currently evaluating the cost and content of databases to support the interdisciplinary research needs of our patrons. As part of this project, Reference Librarian and Adjunct Assistant Professor of Law Sara Gras is compiling a spreadsheet of databases available through BLS Library that pertain to medical topics. She will compare this list to resources available at New York Academy of Medicine Library, which accommodates members of the public by appointment. Then, our staff will evaluate whether there are key indexes (or other sources) that are not covered by either BLS Library or NYAML. Ms. Gras also plans to create a publicly accessible web guide to assist students in next semester’s Bioethics class. 4) In conjunction with Professor Fajans, Reference/Access Services Librarian and Adjunct Assistant Professor of Law Kathleen Darvil held a Seminar Paper Workshop on September 14, 2011. 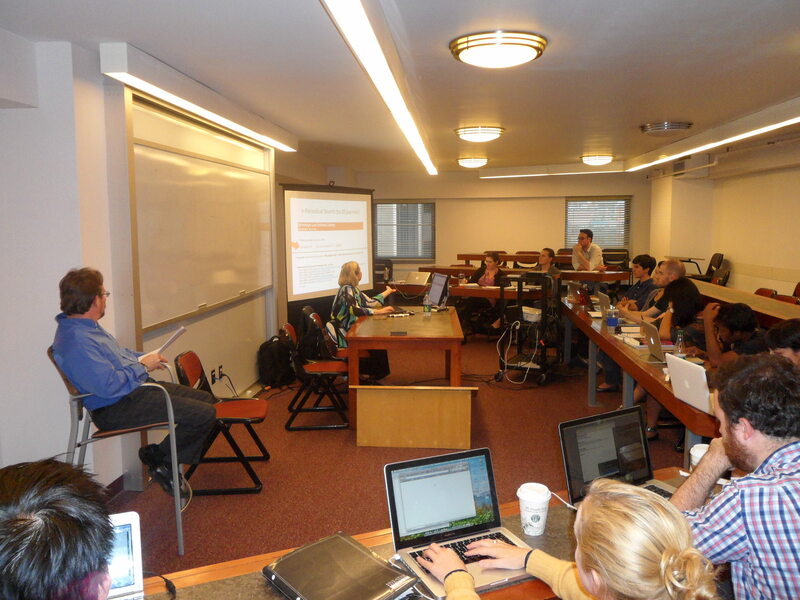 The web guide and video of this Workshop are available at http://guides.brooklaw.edu/seminarpaper. I will partner with Professor Fajans to reprise this popular Workshop next semester. 5) Over the past few weeks, I have made presentations to the following classes to highlight research sources: Consumer Law; Safe Harbor Clinic; and Investor Rights Clinic. 6) To ensure that the library responds rapidly to the increased number of requests made through the new ILLiad electronic interlibrary loan system, three librarians have received supplemental training and are now actively supporting this initiative. I want you to know that the BLS Library staff is working very hard for you.